Gigabyte is no stranger to the world of high performance computer parts. Early this year I reviewed the first motherboard in their latest line of ��Ultra Durable�?lineup, the GA-EP45-UD3P. With an additional 2 ounces of copper in the PCB, we found the board to be one of the best solutions at any price for Intel Core Processors. Today we get our first ever look at a video card from Gigabyte, the GTX 260 Core 216 Super Overclock. That��s a mouthful, but I suppose we have NVIDIA to thank for that! This video card from Gigabyte features the wildly popular GTX 260 core 216 GPU, but does fine screening of the cores to get the very best. These top bin chips are then mated to a PCB that features an extra 2 ounces of copper on the PCB, along with high quality voltage regulators, to bring you the highest clocked GTX 260 core 216 of any manufacturer. The standard core clock of 576MHz has been bumped up to 680MHz, which is an 18% frequency boost over the NVIDIA GeForce GTX 260 reference design. With clock speeds like this you can expect 3% better performance than standard GTX 275 graphics cards! Needless to say, this card is part of their Ultra Durable lineup and promises to be amongst the very best values in graphics cards today. At a retail price of $195.50 it is not the least expensive GTX 260 core 216 you can buy, but is without a doubt the highest performing. 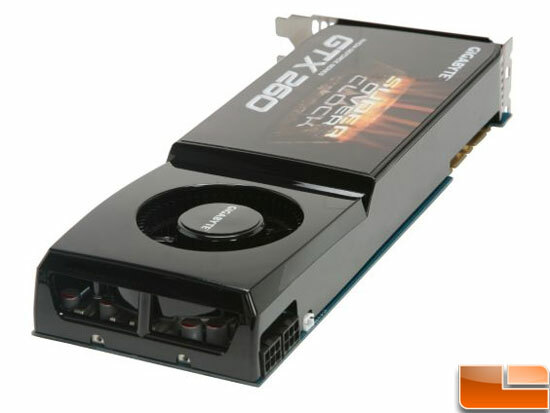 As you can see in the photo above, the card itself looks like any other GTX 260. Of course the biggest differences between this card and a reference card are the extra copper in the PCB and the screened chip: two things that do not really lend themselves to being shown off. Our card still uses a pair of 6-pin PCIe power connectors. 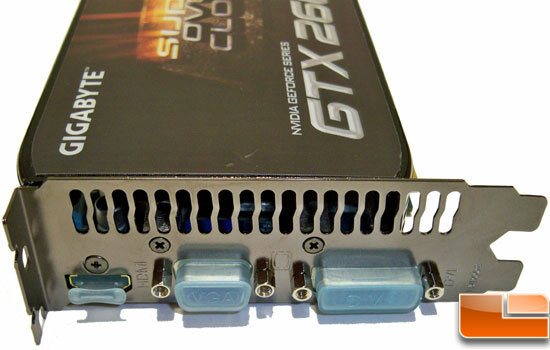 The recommended power supply is 550 Watts or greater with 2x6-pin PCIe power cables. Out back we find a nice surprise in the types of connectors available. HDMI, VGA, and dual-link DVI round out the connectivity. I personally like the assortment as most gamers have just one monitor, and this arrangement should suit all but Display Port owners. On the backside of the card we see a blue PCB, which has become a mainstay of the Ultra Durable line of products. At the top of the card you can see the pair of SLI connectors for running up to three of these cards if the rest of your system is up to snuff.